*The Prickly Postman returns, this time with a design argument for the ages. Make sure you weigh in with your comments below. Thanks again to Jerod for a GREAT post. I’m going to make a quick assumption about everybody who’s about to read this - if you’ve ever used a mixer, it was either a KitchenAid, or you wished it was. I wouldn’t want to guess how many have been listed on bridal registries through the years. Practically unchanged since 1919, KitchenAid hit a homerun and ran with it. There’s nothing wrong with that. It does beg the question, though: have you seen any new designs lately that will still be in production in 90+ years? 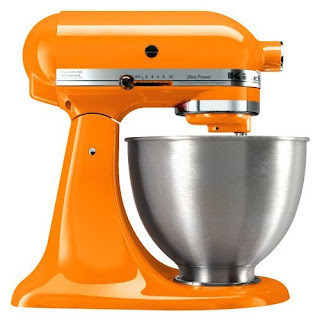 The answer is clearly no, because nobody ever buys another KitchenAid mixer (well, unless they want Buttercup Yellow instead of Tangerine Orange). One is enough; it can’t be improved upon. And that isn’t exactly a great business model. Companies are left with the task of making us want something new every few years, or going out of business. Segue to the Ford Mustang…as much as I hate ‘em, they make a great example. They’re redesigned every five years or so, and everybody goes nuts for the newest, hottest model. They don’t go any faster, and they damn sure don’t get better gas mileage…they just look different. And that’s fine. But have you noticed that the newest models look eerily similar to the oldest? Do we not have any industrial designers left, or have they just run out of ideas? Do we really have to rehash the great designs again…albeit in a watered-down, smog-restricted, airbag laden form? Instead they’ll just want their Grandad’s old Mercedes…and their Great-Grandmother’s KitchenAid mixer. 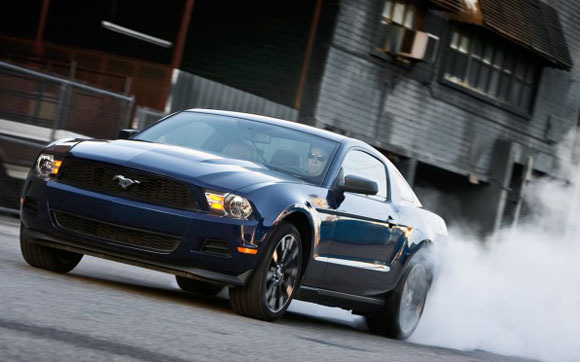 BTW, $24,500 will buy you a new copycat Mustang at any Ford Dealership. The ‘65 fastback gem seen above sold on March 12 via eBay for the same money. Which would you rather have? Jeep Cherokees together with bailing twine. If the Mustang and KitchenAid mixer are status symbols in suburbia, why have luxury automobile and appliance manufacturers continued to make changes and upgrades? Comparing a mythical $1K luxe mixer to a KitchenAid stand mixer is a different story. I guess I've fallen in to the trap myself. Great thoughts- not anything I'd ever considered before. There are tons of cars I'd rather have than a Mustang too, Nick...and any Benz would certainly be one, provided it was made before they absolutely ruined the brand in 1988. This really wasn't a car post, though...I was actually just reveling in the perfection that is a Kitchenaid stand mixer, and bemoaning the total lack of similar designs in other mediums. BTW, I'm not just picking on Ford. I can't think of a single vehicle that I find stylistically superior to it's predecessor. I'm a Jeep lover through and through, and in my estimation, each Wrangler model is worse than the one before (and they're ALL worse than the CJ models they replaced). Good point. 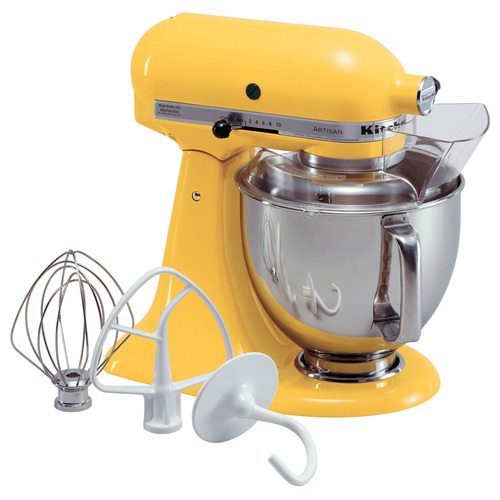 Do you think there is a reason that KitchenAid hit the jackpot when they first released the stand mixer(as we know it)? What do you attribute to lack of design prowess elsewhere? Lack of imagination? Ingenuity? Alas, I think modern construction materials and mass production restraints may have hamstrung many designers. That new Mustang looks more plastic than metal, and I'll bet the good folks at Kitchenaid have had a hard time automating production of their mixers. There are a few designers that read here- I wouldn't wear flip-flops if I was that worried about my toes. I'll expand on your thought and say that sometimes kitchen designers limit themselves by trying to be too "green" or whatever happens to be the hot buzz-word of the moment. *Yes, I like sustainable natural resources and no, I don't want to cut down the rainforest so I can have nice cabinets. Hate that I have to have a disclaimer. Aren't you glad Chippendale and Stickley and Porsche and Benz didn't have to use biodegradable materials? Maybe that's why new designs are lacking: why devote too much time to designing something that's SUPPOSED to rot? "Programmed obsolescence," said the daughter of a GM executive. Jerod- It doesn't get a whole lot better said than that. Raina- I guess that's it... the only way to have something new is to ditch something that was potentially superior. The question remains... How did KitchenAid do it? Question....what was the take on the KitchenAid when it first came out? Did people find it austentatious and too expensive or did they immediately wrap their arms around it? Yes, I too would love one for my counter some day but being the frugal one I am, stuck with my $6.00 mixer from the Dollar store that I owned for 11 years until I blew up the motor last year making cookies. Sadly, the new one was more expensive and not even close to the same ability. I think that is what is tough in the market for all manufacturers of gadgets....they do need for you to come back and buy again. But, what is lacking these days is any type of value the one you are buying. And, yes, Nick...I think people get very tripped up on the catch words of the day, rather than designing what makes sense. P.S. I'd never buy a new plastic Mustang...there is something about sitting inside a muscle car and hearing the engine purr and the exhaust (yes, which causes smog but the thrill of the sound is so amazing). Hubs has '65 Mustang GT that he plans to lovingly rebuild and restore over his lifetime. I myself am more of a Camaro chick or Vette, but would never underestimate the feeling of riding in one of any muscle car. People seem to operate in a disposable world lately - always trying to be better and newer - and so companies respond in kind because it drives demand for their products. But when KitchenAids were originally produced consumers wanted things that had value and lasted. That doesn't mean we can't improve upon items - innovation is always essential! Until consumers change how they want their products, companies have no incentive to change their business model. Amy - Agreed on the toughness of the gadget market...but then again, what other market functions so much on convincing you to buy something you really don't need? I'm thinking Fondue pots, single serving coffee makers, etc. BTW, I'd opt for a '70 Chevelle myself! Sauce - I think your comment hit the nail pretty much on the head. One wonders, with the marketing pushes towards sustainability and biodegradability, why consumers wouldn't realize that nothing is more earth friendly than only buying something ONCE! 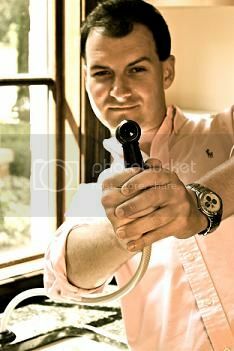 You don't wear your KitchenAid but you do wear your Mustang. The auto industry decided years ago that the car was fashion. If it didn't break down, not an issue with most North American manufacturers, there needed to be another reason to update your four wheeled wardrobe. Also the design of the mixer aids a lot in it's function. Auto design is mostly about aesthetics. Arne- Interesting points. So those of us that like old cars just aren't "with-it" anymore? Laguiole - French for Luxury? #LetsBlogOff- What is Legacy(or what it isn't)?